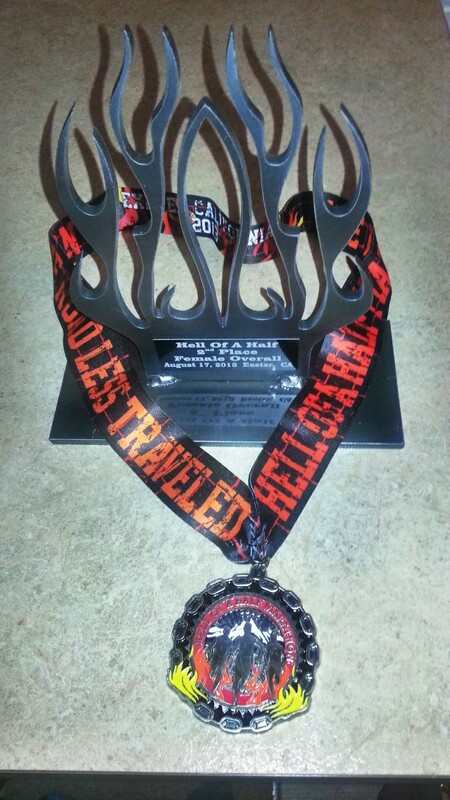 Hell of a Weekend: Hell of a Half (Race 1 of 2) | Trace B. This last minute race turned out to be a great decision. It was my ego that prevented me from running any short road races as I prepared for my marathon. Let me explain. My current marathon training schedule isn’t a typical marathon training schedule because I am also training for a 50K and a 100-miler. The differences in my schedule compared to a marathon only schedule are that I don’t do track workouts on Tuesdays, I instead run intervals on the road, and I do back to back (hilly) trail runs on Saturday and Sunday (like ultra marathon training). It’s been an adjustment, convincing myself that I don’t need to run 5:35 mile repeats on the track and that the trail running won’t slow me down. I really believe in my coach (Andy) and this program and I know my coach believes in me so in reality, I have already accomplished big things! In fact, I am lucky to have him because I am sure it is not easy to train someone with such varying race distance goals! So going back to this race, I didn’t feel half marathon ready, but I knew I could run a half at 6:35-6:45 pace based off of my recent tempo and MRP workouts. Of course, I had to pick a scorching hot and hard course (two hills about 1.5 miles each around miles 5.5 and 9.5-ish) that wasn’t stacked with speedsters like the men’s side…it was definitely not going to be a PR day but that wasn’t going to keep me from having a great day and experience! The goal for the day was to do my best running 6:30-6:40 pace and finish the race using the experience to build my confidence for my upcoming marathon. 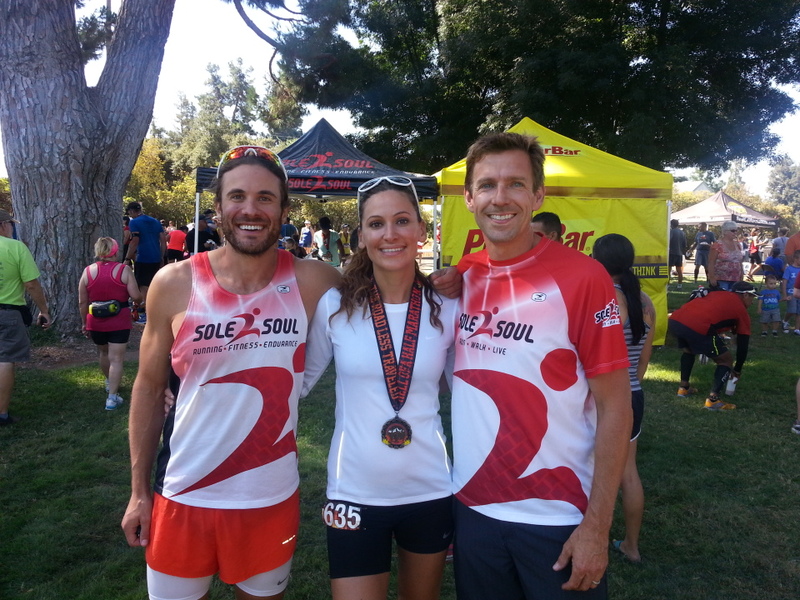 I was also VERY excited to be able to see Andy and all my teammates from Bakersfield, not to mention the opportunity to support one of the best running stores around in the Central Valley: Sole to Soul. As the gun went off (or horn, don’t remember), I solely focused on my pace and was pretty comfortable until I saw the dreaded upcoming hill. Yes, I do run hills during trail running but it’s different to encounter a long one that you can’t possibly walk up like an ultra – you have to keep charging up, as every second becomes valuable. It was towards the end of this first hill that the first women and her pacer/water-guy passed me. Following this hill, just like the next upcoming hill, is a long downhill reprieve that allows you to make up some time. My splits for both hills were nearly 8:00 per mile, losing at least 3:00 minutes of time for the whole race. As I approached the second hill, I saw Gabe who ran to my side to take some photos. He must have felt bad that I was laboring up the hill so he continued to encourage me up the hill and then doused me with freezing cold water at the aid station before we parted ways. He was there to cheer for his friend(s) and I wished that he could have ran me in to the finish because I had been staring at first place women getting assistance from her pacer and her parents(?) who were driving ahead of us just past every aid station to cheer and hand off ice-cold water bottles to their runner(s) and I was doing everything I could to not let that distract me…but man, that would have been nice to have the same and to see familiar faces on the course. BTW, I am not insinuating anything more than the observation I made; It was perfectly legal as there were no rules against in on the race site. She would go on to beat me and I am happy for her accomplishment of a W and think she is truly lucky to have such a great crew and team of supporters. 🙂 End of topic. Anyway, I thought I would try my best to make up the most time after the second hill in to the finish and apparently the first place women thought the same thing because she did not lose any ground after cresting that hill and finished very strong. I crossed the finish line happy, running a little over 1:29 and couldn’t wait to catch up with all my friends. This race lived up to it’s name for sure, it was HELL of a race, we got great swag including a nicely designed Mizuno tech top and a Trailmaker backpack along with great finisher medals and prizes that included an engraved glass mug, fabricated flame-like trophy, a Tahoe Joe’s gift card ($75), and a whole lot of cold chocolate milk at the finish (yum)! As the event was coming to an end, D and I were invited to head up to Oakland the following day for a trail race with Oswaldo. D and I hurried back to his place to rest up for the busy day ahead. Just a few cool awards given out on race day. This entry was posted on August 20, 2013 by tracebee. It was filed under Race Reports and was tagged with Hell of a Half.